I love just about everything about alcoholic beverages, especially whiskey. I love the complexity, the flavors, the texture of the ingredients, the aromas, the sociability and oh yeah, how it makes you feel! 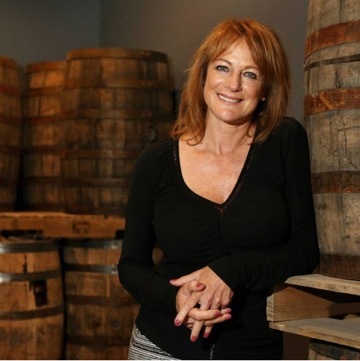 You could say I have been training my entire life to be founder and CEO of Boston Harbor Distillery. I’ve had a decades-old love affair with alcohol. As a young girl, I started tasting my father’s whiskey and ginger and have been smitten ever since! My journey began in 1984. Jim Koch inspired me to help him start Boston Beer Company, makers of Samuel Adams beer. Little did we know then that it would become one of the most recognized and successful craft beer brands in the US. For 15 years we forged a path that paved the way for the craft beer revolution. Some of the accomplishments I’m most proud of is being recognized by the Brewer’s Association as “the pioneering woman in the beer industry” thus leading the way for other women to take their rightful place in a traditionally male-dominated industry. Being featured in INC Magazine’s “25 Entrepreneurs We Love (and what makes them great)” along with other luminaries like Jeff Bezos, Steve Jobs, Larry Page/Sergey Brin to name a few was an honor. And, receiving the “Maverick Award” from Beer Business Daily and Draft Magazine Top 10 Innovators award were career highlights. Ironically, the process for whiskey starts off as beer, so I’ve now come full circle. I’m excited about the future for craft distilled spirits and we are making some of the best in the business at our historic distillery located on Boston’s southernmost waterfront. When I’m not at the distillery, you can find me at one of the hundreds of places that offer Boston Harbor Distillery products or at one of the thousands that still have yet to discover them, spreading the good word! I am passionate about paying it forward as well. Currently, I’m chairman of the board of The Jett Foundation, a non profit helping to raise awareness and funds to support those afflicted with Duchenne Muscular Dystrophy. I married to Matt Shanley for over 20 years. Both of us are entrepreneurs and lifelong residents of the Boston area. Together we are raising three children — Callie, Alex and Courtney.